Yes, I did read my calendar and YES, I know it's Wednesday - BUT, I didn't get my card done for the Stamping 411 Design Team before I left for vacation, so I HAD to finish it! KWIM? So, here is the awesome sketch from our Sketch Queen, Selene Kempton. As you can see, I took a few liberties with the layout, but the sketch is supposed to be a starting point for our creativity. We don't always have to follow the layout exactly - that's the fun part of making a project your own! 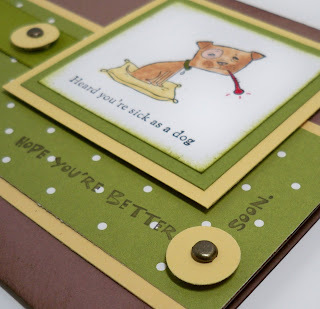 My focal point is this poor little sick doggie from the NEW stamp set, Wellness Wishes. 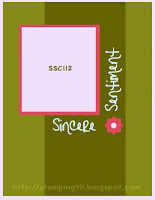 I just had to have this stamp set when I saw it in the new catalog and the best part was that I didn't have to buy it - I earned it FREE from Stampin' Up! because of my sales total last year! Yippee! I LOVE free stamps! Anyway, I cut the Whisper White cardstock at 2" x 2" square and then cut the mats at 1/4" larger for each. I used Old Olive and So Saffron there. 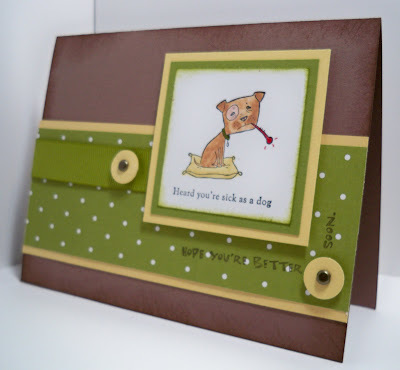 The little doggie was stamped in Black Staz-On ink and colored in with Stampin' Write Markers: Creamy Caramel, Blush Blossom, So Saffron and Real Red for the bursting thermometer! I added the red splash with the fine tip to show you just how sick this little guy is! The white cardstock was sponged with a bit of Old Olive ink and adhered to the two layers with SNAIL. I then mounted it with Stampin' Dimensionals to the card base. The card base itself is a half piece of 8 1/2" x 11" Close to Cocoa cardstock cut at 5 1/2" x 8 1/2" and folded in half to make a card sized at 4 1/4" x 5 1/2". I sponged all around the edges pretty heavily with Close to Cocoa ink to give it some texture and depth. The two long layers are Old Olive Patterns Designer Series Paper cut at 2" x 5 1/2" and So Saffron cardstock cut at 2 1/4" x 5 1/2". I added a piece of Old Olive 5/8" Grosgrain ribbon to the left of the focal point and wrapped the open end around these two layers. It's adhered to the back with SNAIL. BEARY for this card since there is no bear on it. AND since I used the STAMP-A-MA-JIG to position it correctly, it really was a snap to do that. I used Chocolate Chip ink to stamp it in on the Old Olive DSP. To finish up the card, I made two little circle accents out of So Saffron cardstock with the 1/2" Circle Punch. I punched a hole for the Vintage Brad with the 1/16" Handheld punch and mounted both of the circle accents with a Stampin' Dimensional. I thought it turned out pretty cute and as it turns out, I now have a friend to send it to! We discovered yesterday that a member of our Design Team, Gretchen Barron and her daughter both have the Swine Flu and are very sick. So, please say a prayer for both of them that they recover quickly~! Have a wonderful day everyone and be sure to check back tomorrow, I'm finally back in the saddle and will have pictures from Convention and some creative projects to post for you this week! Place an order for all the products I've used on this project! Just click on the SHOP NOW button at the top right corner! Love your interpretation of the layout! I would say it is about time you cofessed your love for this AWESOME tool we carry!!!!LOL!! Now that you know how to use it it really is easy to use and a must have tool!!! Love the card too!! Robin, it's gorgeous!! I love my SAMJ....glad you like it now too!! !